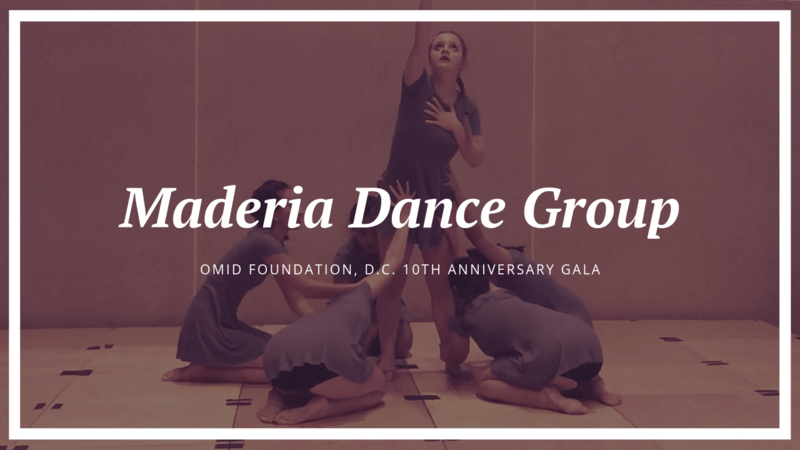 One of the highlights of the Washington DC, 10th Anniversary Gala, held on Friday, October 19th, at Silver Springs Civic Cente was the contemporary dance performance by the Madeira Dance Select Group. Choreographed by Sophie Fouladi alongside Allison Hoang, Annabelle Pearce, Perrin McHugh, Jacky Lee, Audrey Leins, and Sophie Fouladi with the Dance Director Michelle Sarson, the dance was flawlessly performed with passion and emotion, and a profoundly touching experience for the guests. Perrin McHugh sat down with Sophie Fouladi, both from Madeira Dance Select Group to learn more about this experience. Below is the full interview. I danced with Sophie in the Omid Charity Gala, and I had the honor of working with her to create beautiful choreography and listen to her share a side of her life I had never known. I got to sit down and talk to her about what Omid means to her, her choreography process and the relevance of the Omid Foundation in today’s political climate. Perrin: Why did you choose to choreograph and perform this dance for the Omid Foundation? Sophie: I’ve been working with the Omid Foundation as an ambassador for three to four years now, and even before I was an ambassador I would volunteer at events and go to committee meetings with my mom. I really resonate with their message of empowerment, especially as a young woman myself. This year, when Farzaneh asked me to choreograph a dance, obviously I was overjoyed because the best way I can give back is expressing these girls’ stories and truth through art, which is the most honest way for me to convey that message. I think that art is such an amazing way to convey stories and dance just happens to be the art I use to share stories. I feel like it would have been such a missed opportunity if I had said no. Perrin: How did you decide what you wanted the dance to be about? Sophie: I really wanted to do a narrative piece, centered around an Omid girl’s journey, and her success story and the struggle and how she got there, which is a really emotional tale to tell. I felt like it was most important to convey the truth of the foundation, and the at the core of the foundation is the girls and their lives and what they’ve overcome. I really wanted to portray the notion of overcoming your darkest days. I think the final product was a really hard hitting contemporary piece and that was where we wanted to end up. Perrin: Was there anything that impacted you, or that you saw affect the whole group as we were coming up with the piece? Sophie: We come from an all girls school that preaches empowering and educating young women, so the message of Omid’s empowering these women really resonated with us. Madeira has been a nurturing place for us to grow and learn in so many ways, and Omid is similar in being a place for the girls to grow and learn and overcome struggles. The message of the dance, of overcoming struggles, of becoming a better person was something we could all relate to. At the end of the day we all really connected with the story of defeating those dark days. Perrin: What’s the process for creating your choreography? Sophie: I usually start choreography with these phrases in my head from listening to the song repeatedly. Listening to different intricacies in the music, because for me dance is about being what music looks like, so having that musicality is a very important part of it. So I had some moves that I really wanted to do, but I also wanted it to be a very collaborative experience for all of us because the foundation has been so inspiring to me for the past couple of years, and I wanted to share that with the people at Madeira who inspire me to be a better dancer. I wanted this to feel like our dance, not just my dance. At the end of the day I think the dance is something we are all proud of, because we know that we all put our own selves into it. Perrin: What was it like trying to get into the emotion of the piece? It’s obviously about a very heavy subject, so what was it like trying to convey that heavy emotion through choreography? Sophie: I see the movement as an empty shell, and whoever is performing that choreography is what makes it the way it looks and feels to the audience. For this kind of piece, one that’s so emotional and heavy in subject, I really wanted to get down to that raw emotion, so a lot of the movement is grounded with less technical movement, because choreography is nothing without the emotion and purpose behind the movement. That’s how I approached the movement, but when all is said and done, it wasn’t what I did, it’s what my dancers did with the choreography I gave them. I am so incredibly proud of them for what they’ve done and how much they connected with it. Perrin: What was it like sharing this part of your life with us? Sophie: I was honestly a little bit nervous, because I didn’t know how everyone would respond to it, maybe that you guys wouldn’t be able to understand why this foundation is so incredibly important to me, and why this is a really big deal for me, but opening this side of my life up to my dance group and embracing them into a part of my culture was so moving and I’m glad I did. The way they accepted it and humbled themselves through this experience was mind blowing. I honestly couldn’t ask for better people to work with and share this creative experience with. Perrin: What do you think Omid’s role and relevance in light of the #MeToo movement and the current leadership in the United States and how that’s started to bring out some ideology that is dangerous to women and minorities? Sophie: I think Omid has a large relevance coming into this new era of women. I think people tend to think that because Omid works with such a small group of specific women in a specific country dealing with specific abuse that the truth of what Omid is doing doesn’t live outside of the walls of Omid, but it really does. Even the smallest amount of kindness and hope in this world can be a life changing difference to one individual person, and those individual people come together to make broader communities that positively impact the world. Note: I would personally like to thank Omid for allowing us to be a part of such a beautiful, inspiring night. Finding Omid was a life-changing experience for these girls, and it was for me as well. The stories of the girls at Omid touched me in a deeply personal way, and I will be forever grateful to have learned about this incredible foundation and the inspiring people who give their time, their money and their love to changing these girls’ lives. Hope is about connecting people, and Omid has done an amazing job of touching people’s hearts and connecting people thousands of miles away from each other. Thank you for the work you’re doing, and thank you for letting us share our passion and emotion with you.